Prepare for leadership and service to the Church with an MACM. 15 courses. 45 semester hours. Complete in as few as 2 years. The Master of Arts in Christian Ministries (MACM) supports leadership and service in ministries impacting Christian community, life and practices. From worship to discipleship, deaconship to pastorate, the MACM can equip you for your call. Our flexible options are designed to make high-quality education accessible for working pastors and other professionals—whenever and wherever works for your busy schedule. Courses are available in four formats. Mix and match to suit your schedule and learning style. Week-long intensives on campus in Dayton, Ohio take place in January, June, August and September. Online courses can be completed at your own pace during the semester. Live Interactive Virtual Education (LIVE) courses meet simultaneously on-campus and online. *Residency requirements may vary by denomination. Most United Methodist students must complete 1/3 of their degree (5 courses) on campus. A three-year program can be completed at a distance by attending five Intensive Weeks (2-3 per year), allowing you to fulfill on-campus requirements without moving to Dayton. The MACM equips people for leadership and service to the church with 9 core courses (27 semester hours) and 6 elective courses (18 semester hours). We’ve made this easy with our new Core + 4 Curriculum. Add a concentration to your MACM by using 4 of your 6 elective courses to specialize in your calling. No concentration? No problem! Use the four additional elective courses to explore other areas of interest. If you have previous graduate-level coursework, you may be eligible for Advanced Standing for the Master of Divinity. Specialize in a concentration that supports your area of ministry. Those interested in a concentration are encouraged to discuss their interests and needs with the Office of Admissions, who can help discern the best path for following God’s call. Take required core courses in the areas of Biblical Studies, Church History and Theology, Practice of Ministry and Spiritual Formation. Use four of your electives in your area of concentration. Complete the entire degree plan requirements listed for the MACM. Complete all course credits applied toward the MACM degree within ten years. Travel to one Contextual Ministry retreat in early September. Completion of two Contextual Ministry courses in one year. Participation in a professionally facilitated ministry group. Ministry in a church or community site in your area. To fulfill residency requirements for The United Methodist Church, United Methodist students must complete 1/3 of the degree (15 credits) on campus. Dayton, Intensive, and hybrid courses count toward this requirement. For ordination requirements, please check with your own judicatory. 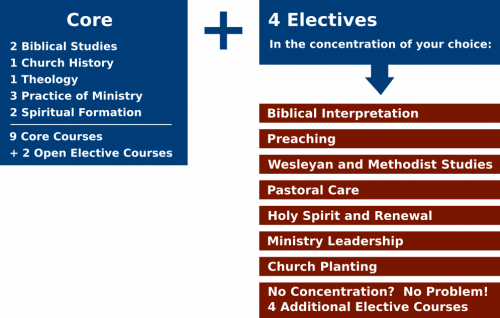 Students may use elective courses to fulfill concentration and denominational requirements, if desired. United Methodists are required to have (6) credits in UM History, Doctrine, and Polity. Learn more about the application process: Masters Admissions page. What is your God-given dream? Let us know how we can help you with your discernment process! I’m ready to answer the call!